Have you started writing that book, but never got round to finishing it? Have you started investing in that business, but never hung around long enough to see it takes off? How much time and money have you spent on that ideas, and projects that you never see through to the finish? 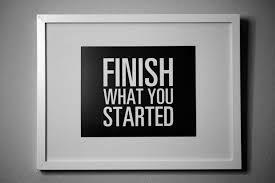 See, the full potential of what you start is only fully realized when you take the time to finish it. My good friend, be accountable. Being accountable to another helps you do a better job. The quality of work is often better and deadlines are normally kept. Commit to it, you need to commit time and resources to the task, there is no progress without commitment. Those who are successful in their business create speed in their lives because they commit themselves to their business. They begin, continue and make sure that they finish what they start, they perfect what they begin. Talk is very cheap. There are many people who talk about what they will do someday but they never get a move on and start something. Successful people are doers. One of the secrets of a great achiever is ensuring that they move daily in the direction of their goals. Let me tell you a story of a young man who once asked a wise man. “Sir, how do I get to the top of mount Olympus?” The man looked at him for a moment and said: “Make sure that each step you take is in that direction”. Similarly, you have to create a rhyme of success in your life by attempting to do little things. When you do little things, they will eventually accumulate and become big things. You can create speed in your life by aiming at and hitting little goals. When you accumulate daily victories, you create a powerful snowball effect which will gather acceleration and make you become unstoppable. Your confidence is boosted when you hit a goal no matter how small it is. Small victories will condition your mind to see yourself as capable and strong enough to take on whatever challenge come between you and your dream. This entry was posted in success and tagged Destiny, Dream, Insight, inspiration, Life Changing, motivation, Principles, Spiritual, success, Wisdom.